If you’re a do-it-yourselfer, or weekend warrior who is always tackling projects around the house, you understand the need to keep your space for these projects organized and neat. 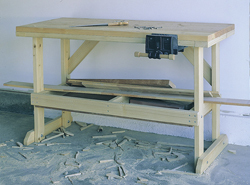 Building a workbench is a terrific way to organize your household projects as they occur and provide you with a safe and spacious place for keeping all of your supplies close at hand. Take a look at these workbenches and workbench plans and discover a style that suits your needs. House Plans and More's collection of work bench plans includes many types and styles that any do-it-yourselfer would enjoy making. We offer detailed blueprints to take the worry away from making a mistake since they are easy to follow. With a wide variety of plans, we are sure that you will find the perfect do-it-yourself project to fit your needs.